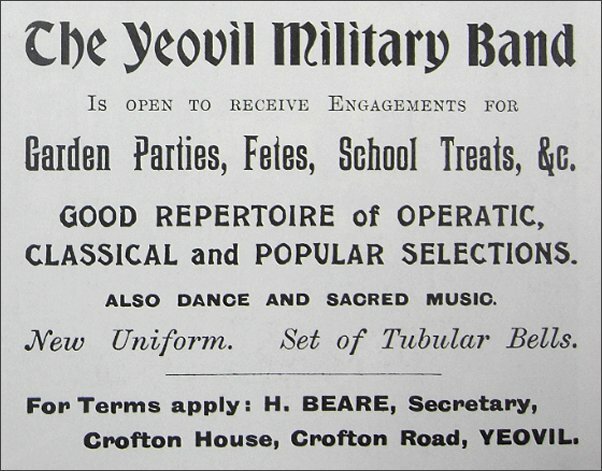 The Yeovil Volunteer Band, also known as the Yeovil Military Band, was officially the band of Yeovil F Company, 2nd Battalion, Prince Albert's Somerset Light Infantry. They were stationed at the Armoury in Park Road, now the Armoury Inn. 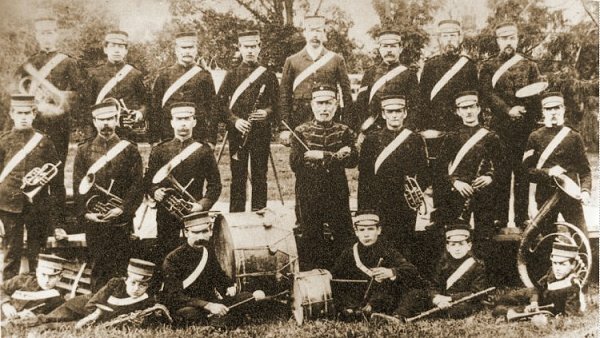 The band was re-formed in 1870 and Alfred Beare was appointed Band Master. Alfred Beare had been a professional soldier and was discharged from the army in Gosport, Hampshire on 25 February 1861, after completing 21 years service, more than thirteen years of which were in India. He served as the Band Master for 26 years, until he retired. Alfred died in 1903, aged 79. A newspaper cutting of 1876 reads as follows "RIFLE CORPS - Order for 19th Nov. 1876. The Corps will parade in the Borough at 10am on Sunday next, the 19th inst, and march to Preston Church to attend Divine worship. If gloves are worn, they are to be of the same colour as the belts. Band will attend. Lance Corporal T Brown is to be promoted to full Corporal, vice Giles from this date. The following members having qualified by examination, are to be Lance-Corporals from this date:- Priv. R McAuley, Priv. J Bambury, Priv. J Bartlett. Any recruits wishing to join the Corps will leave their names at the Armoury at once." In 1879 the Post Office Directory noted "16th Somerset Rifle Volunteers (Armoury, The Park) - Captain Harbin; Lieutenant Hunt; 2nd Lieutenant Marsh; Chaplin, Rev. R Newman; Acting Surgeon, WF Tomkyns; Sergeant Instructor, W Symes; Band-master, Alfred Beare." A report of the annual dinner, with catering by William Seabright, of the Yeovil Volunteer Band of the 16th Somerset Rifle Volunteers at the Royal Oak as reported in the 31 January 1873 edition of the Western Gazette. 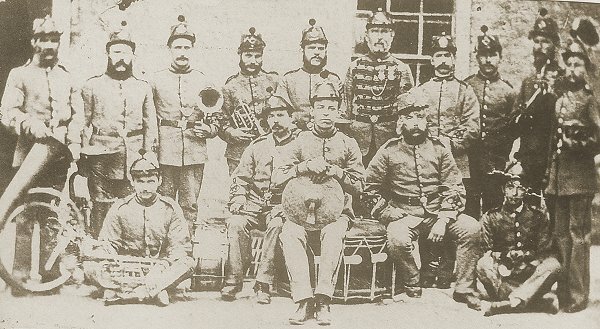 Bandmaster Alfred Bear with the Yeovil Volunteer Band - the band of Yeovil F Company, 2nd Battalion, Prince Albert's Somerset Light Infantry, photographed around 1880. Standing, left to right, Alfred Dunn, Ebenezer Giles, Harry Pomeroy, Walter Bond, Herbert Jenner, Alfred Beare, William Fort, Jack Fort, Charles Lane, EJ Lucas. Seated; George Larcombe, Walter Creese, Albert Ostler, Herbert Slade, unknown. The Yeovil Military Band's advertisement in Whitby's Yeovil Almanack Advertiser. The Yeovil Military Band, in yet another uniform, with Band Master Alfred Beare at centre. 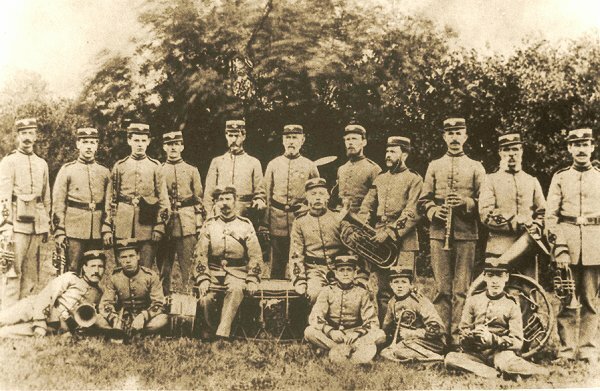 The Yeovil Military Band in 1892. At centre, with the beribboned tunic and holding the baton is band master Alfred Beare. Officially this was the band of Yeovil F Company, 2nd Battalion, Prince Albert's Somerset Light Infantry. 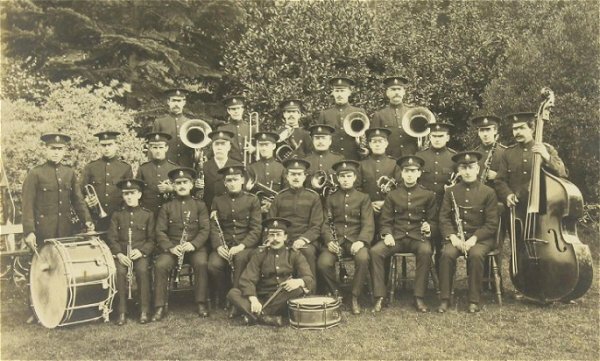 Yeovil Military Band photographed in 1913.